Step 1 Cook the bacon until crisp, drain on paper towels and set aside. Step 2 Place the slices of cheese on one slice of the toasted bread and place in a toaster oven or under a broiler to melt the cheese. Step 3Spread the other slice of toast with the mayonnaise, top with the cooked bacon, the sliced tomato and the lettuce. Step 5Slide the finished egg on top of the lettuce. Top with the other slice of toast, melted cheese side down. Place the sandwich on a plate and slice in half, letting the yolk run down the sandwich. In Recipes-list.com we have selected the most viewed recipes from category - Quick and easy Sandwiches . Enjoy the best recipes specially selected for you! 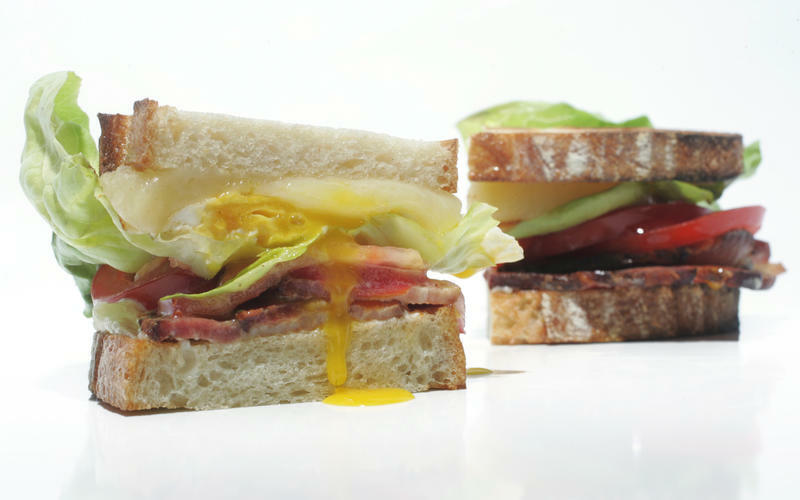 'Spanglish' BLT with fried egg and melted cheese is the right choice that will satisfy all your claims.